Saddened because they have left one of their number in a grave in the wilderness, Harold and his companions continue their journey to the dreaded underground palace of Hrad Spein. There, knowing that armies of warriors and wizards before them have failed, they must fight legions of untold, mysterious powers before they can complete their quest for the magic horn that will save their beloved land from The Nameless One. But before they can even reach their goal, they must overcome all manner of obstacles, fight many battles…and evade the frightful enemies on their trail (goodreads.com). 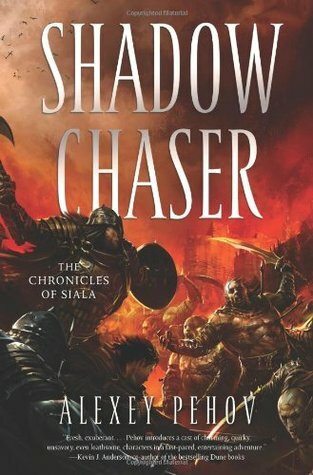 Shadow Chaser begins right where the previous book left off with the group heading into the city of Ranneng. Unfortunately, they spend almost the entire book just in this city because the precious key they are traveling with ends up getting stolen so they have to get it back. Turns into a big fiasco. Even though most of the book is spent just in this city, and it can be slow in parts, the story still remains rather interesting, and I really enjoyed it. The characters are great, especially Kli-Kli! However, I do believe, especially for such a short series, that there are way to many characters. There are at least 14 characters, if not more, to begin with and it becomes a little overwhelming. I can see why the author decided to start with so many (many of them probably end up getting killed, so there wont be many left), but it just makes the character development more difficult. I did notice that Harold is developing a little bit more, but not much. One thing I noticed is that he is really starting to make friends and liking it, which is something the old Harold didn’t care for. A lot of the attention was focused on Harold in the first book, but we get to see a lot more of the other characters now, though not much development. There is Kli-Kli, who is a very interesting character. I knew from the last book that he was more than just a jester, and we definitely learn more in this book. He acts more serious at times, knows a lot about everything, and is keeping secrets from Harold. He knows more than he is telling everyone, and is not the fool everyone believes him to be. Which makes me wonder who he is exactly and what he is hiding. Very mysterious! He is also still up to his shenanigans, which are always fun! The author also spends quite a bit of time with Eel. We learn a great deal about who he is and where he is from. Don’t want to spoil anything though! That’s about it. There are many other characters including Loudmouth, Miralissa, Egrassa, Alistan, Uncle, Honeycomb, Lamplighter, Hallas, Arnkh, Deller, and Ell, who don’t show any progression throughout the novel. I honestly don’t know much more about them then their race. I can’t begin to explain why so many characters is such a bad idea! Why can’t all of his characters be like Kli-Kli! There was a huge reveal in this book, but because I didn’t know the character very well I didn’t really care that much. Also, as you may expect, there are several characters who will not make an appearance in the next book. I didn’t really know them very well, so I can honestly say that I don’t care that I wont be seeing them again. I feel like this is such a great story, but the lack in character development is definitely its downfall. I really enjoyed the book. There were many interesting battle scenes, and we get to learn more about the history of Hrad Spein and the Key, which makes this an important addition to the series. If you loved the first one, then you should read this one. Just do what I did and ignore most of the characters and just focus on Harold, Kli-Kli, Miralissa, and Eel, but really just Kli-Kli because he is awesome! The book was fantastically translated from Russian, so I have no complaints about the writing! Even though the story lagged in some parts, there were others that really kept me interested and by the end of the book I was excited to start the next one as they finally enter Hrad Spein!